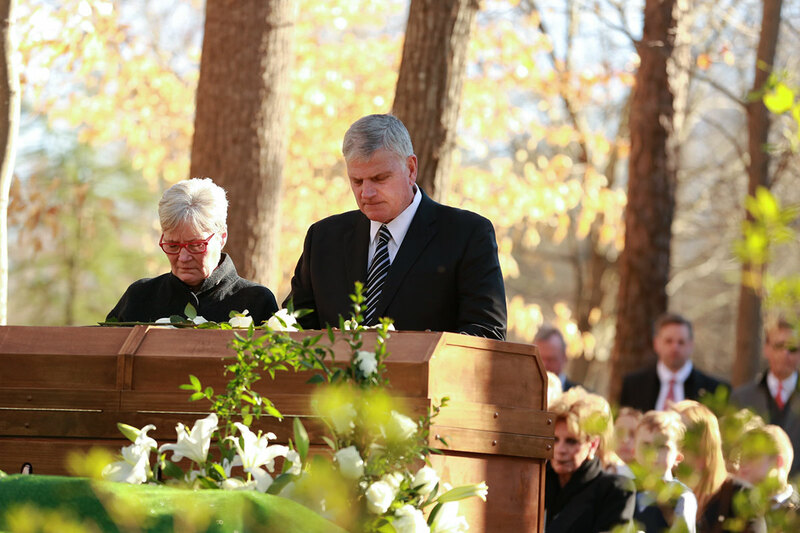 Left: On 21st Feb 2018, Billy Graham left this earth to be with Jesus for eternity. 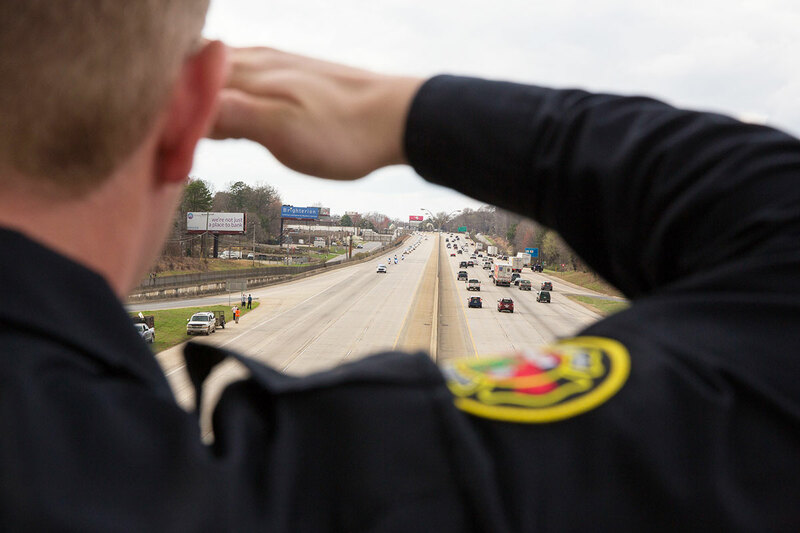 Thousands of people lined the roads and highways as a motorcade escorted his casket from Montreat, North Carolina, to the Billy Graham Library in Charlotte. 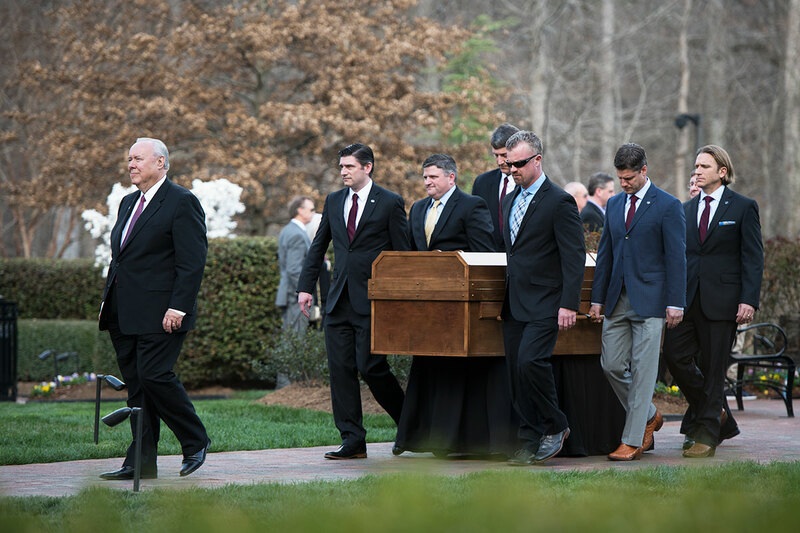 Right: Six of Billy Graham’s grandsons carried his simple wooden casket across the grounds of the Billy Graham Library, where the public was invited to visit in the days following the evangelist’s death. 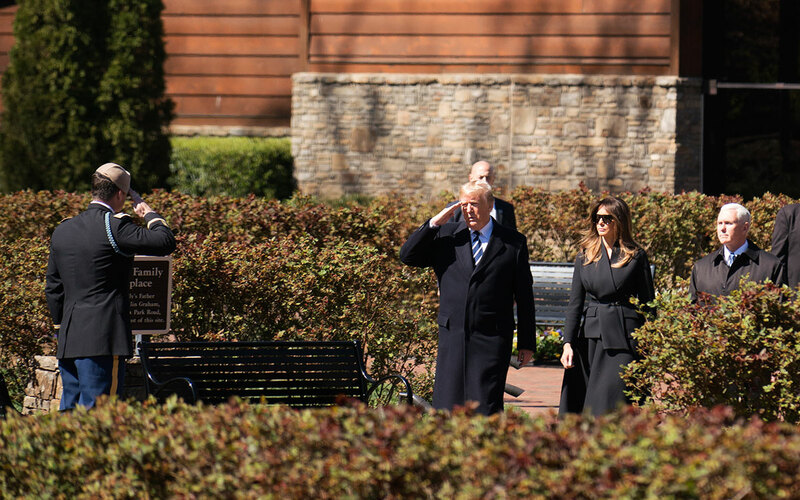 Right: Billy Graham’s grandson Major Edward Graham salutes President Trump as he arrives with first lady Melania Trump and Vice President Mike Pence at Billy Graham’s funeral service in Charlotte. 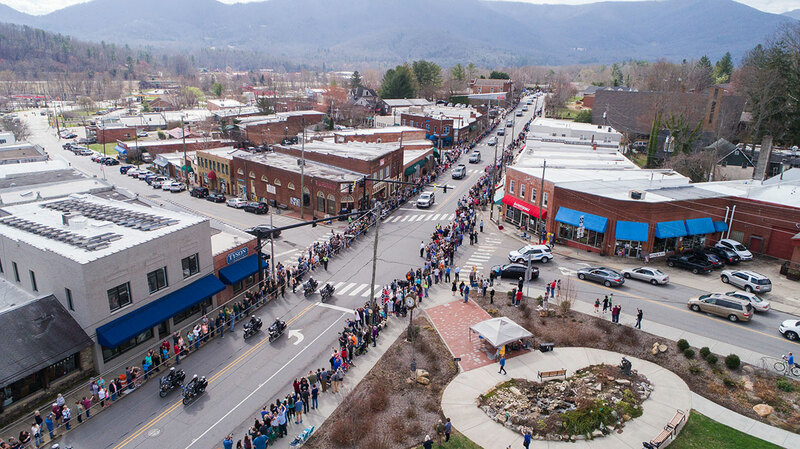 The sidewalks of tiny Black Mountain, North Carolina, were crowded with people as Billy Graham’s motorcade passed through. Town Hardware & General Store, formerly Black Mountain Drugstore, can be seen in the middle of the photo. Many decades ago, Mr Graham would ride his horse there from his home a couple of miles away. 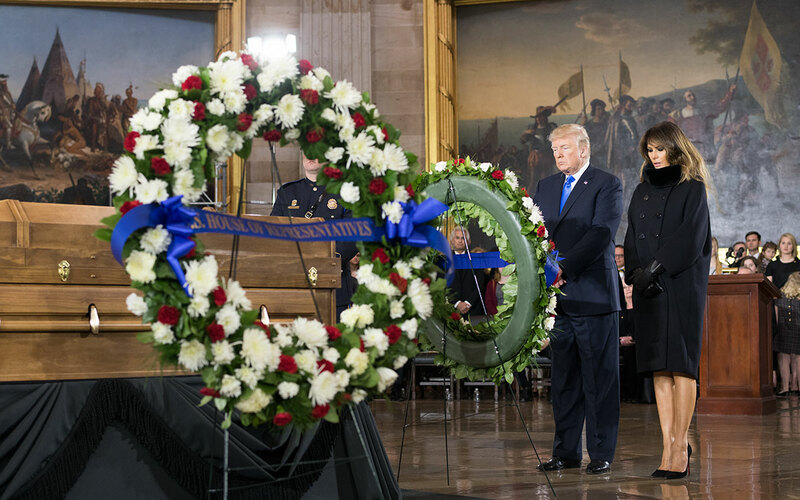 Billy Graham’s casket can be seen in the center of the Capitol Rotunda in Washington, D.C., where President Trump and a host of elected officials from both parties paid their respects during a ceremony on 28th February. Mr Graham was the fourth citizen in U.S. history to lie in honour beneath the soaring Capitol dome. 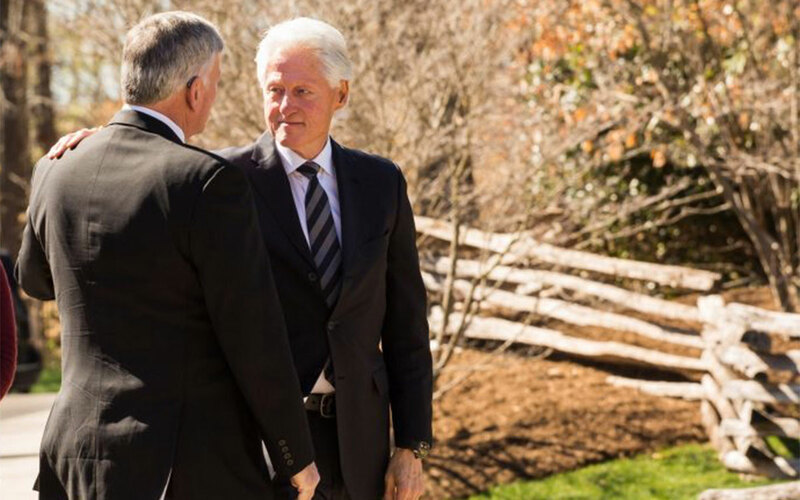 Left: In April, the Festival of Hope with Franklin Graham made history. The two-day event in Lisbon, Portugal, marked the first time BGEA held a Crusade event in the Mediterranean country. By the end of it all, nearly 2,000 people had indicated making a decision for Christ. 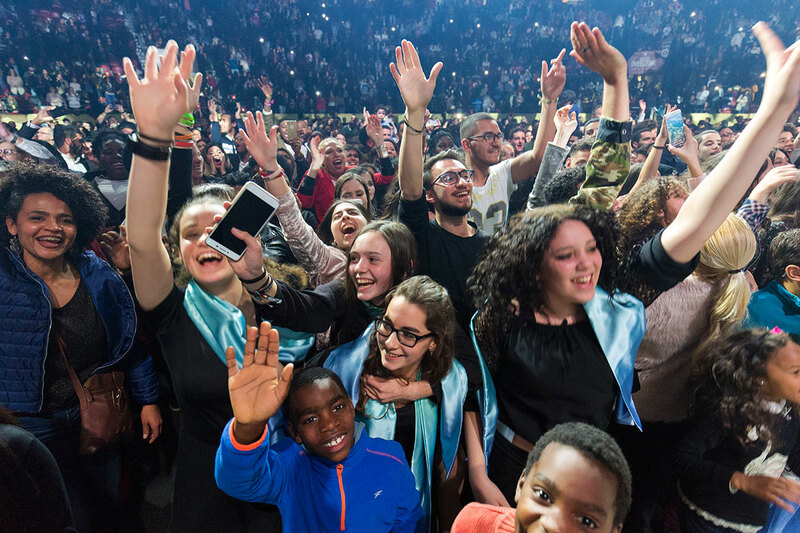 In addition to the audience of about 27,800 people in Portugal, the reach of Franklin Graham’s Gospel message expanded greatly online, with upwards of 70,000 viewers via BillyGraham.org and social media. 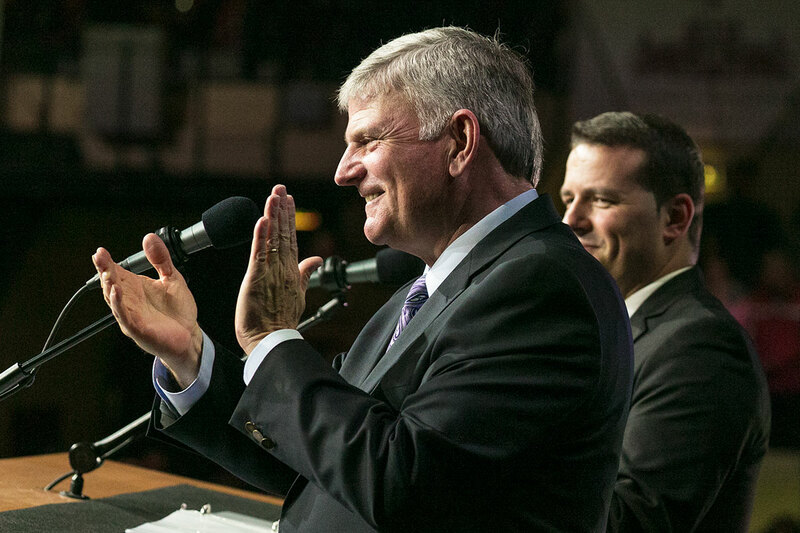 Right: “This is God’s Gospel – and I believe there is supernatural, Holy Spirit-filled power in this message.” The Lisbon Festival of Hope was BGEA’s first Crusade event of the year – and Franklin Graham’s first time preaching since his father, Billy Graham, passed away in February. Before the Festival ended, Franklin Graham applauded the local team in Portugal for their committment to sharing the love and joy found in Jesus Christ, no matter the circumstance. The Tri-Cities Celebration with Will Graham helped many people find freedom in Christ. Some 9,000 people came to Freedom Hall Civic Centre over the three-day Celebration in Johnson City, Tennessee, 27th-29th April. Hundreds streamed forward each night in response to Will Graham’s invitation to publicly accept Christ as Lord and Saviour. Left: This year marked the Billy Graham Rapid Response Team’s (RRT) first ever response to a volcanic eruption. 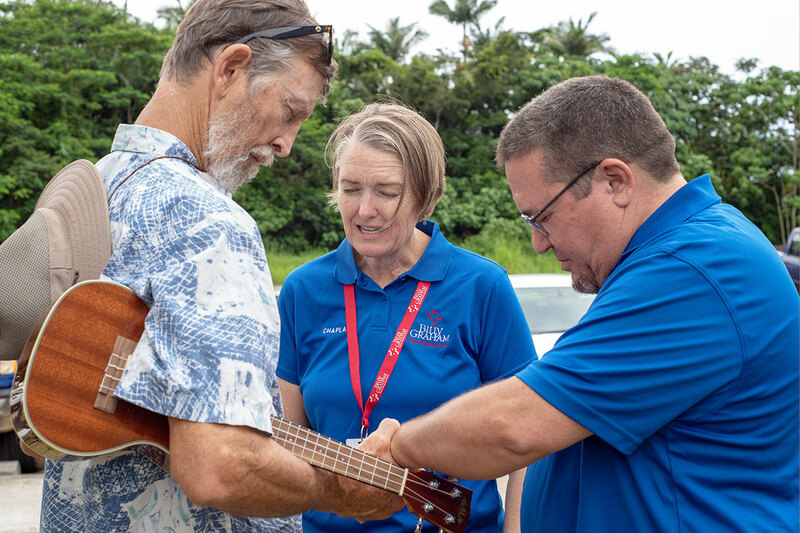 In May, a team of crisis-trained chaplains deployed to Hawaii’s Big Island to offer emotional and spiritual care to those facing the dangerous activity of the Kilauea Volcano. 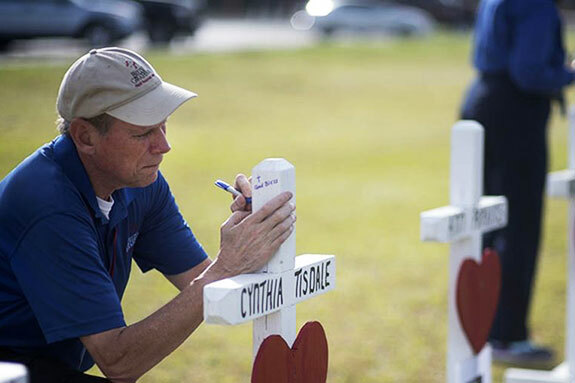 Right: A Billy Graham chaplain writes a personal note on one of 10 crosses after a shooting at Santa Fe High School in Texas. Before summer, the RRT responded to three fatal school shootings in 2018, including Parkland, Florida, and Benton, Kentucky. 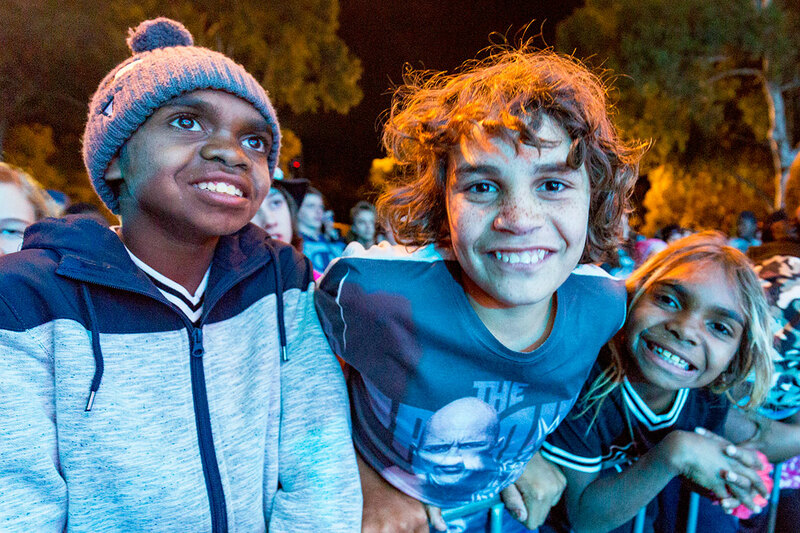 The three-day Goldfields Celebration with Will Graham in Australia included music and messages geared towards children. There were also special efforts made to reach out to the Aboriginal community. Thousands of people attended the events, and hundreds came forward to make a decision for Christ. 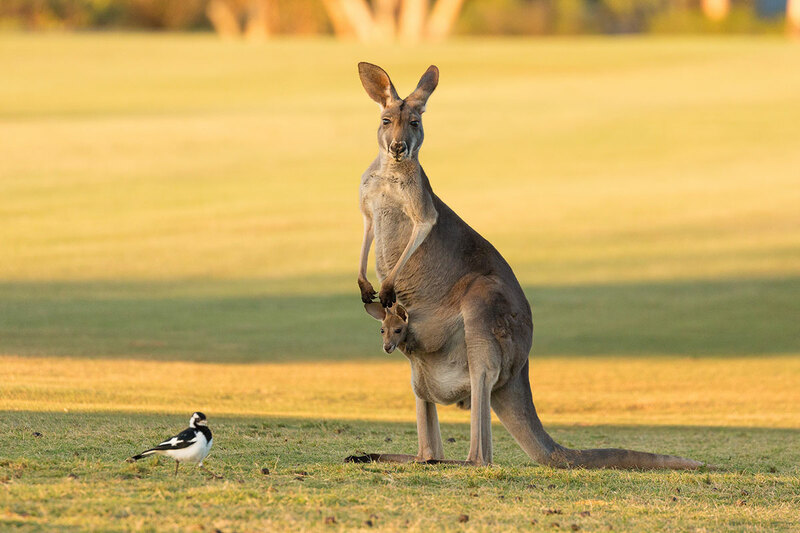 Left: The kangaroo is perhaps the best-known symbol of Australia, a country where BGEA has a long history. Billy Graham preached all over Australia in 1959; it’s estimated that a quarter of the nation’s population heard the Gospel at one of his Crusades. In 2019, Franklin Graham is planning to share the hope of Christ in many of the same cities where God used his father to change lives for eternity. 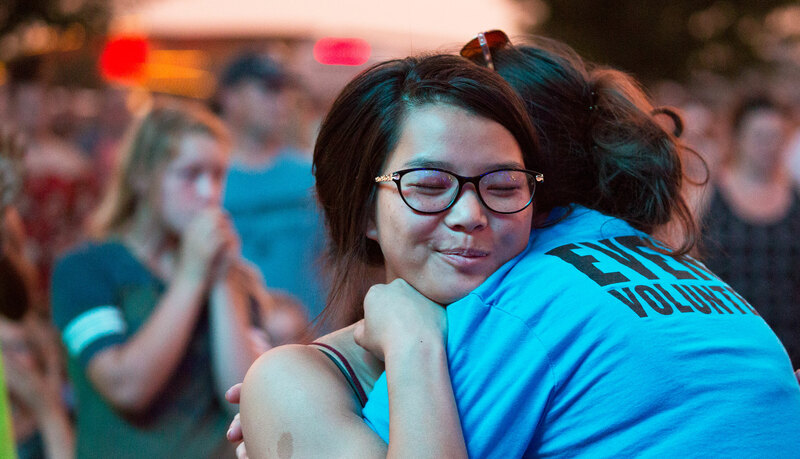 Help take the Gospel around the world by giving to support the ongoing mission of evanglism. Right: The After’s lead singer, Josh Havens, invited more than a dozen kids onto the stage to sing and dance. The band has joined both Franklin Graham and Will Graham at Crusade events around the world. 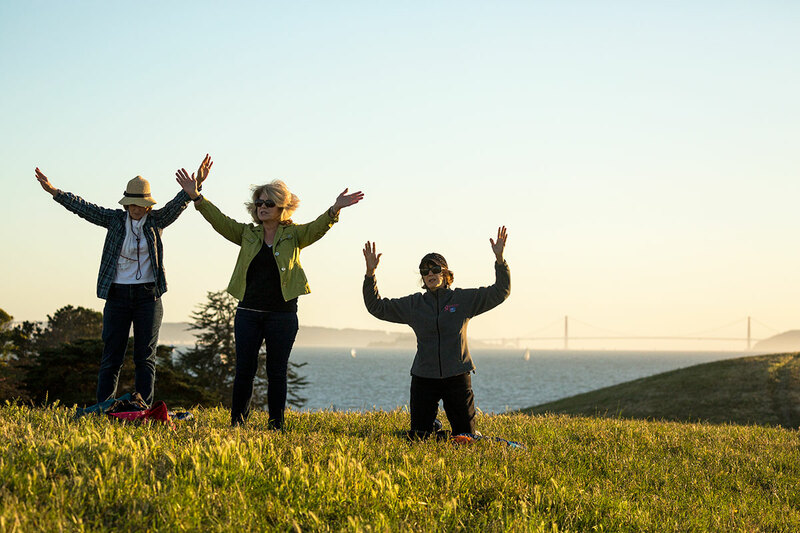 Franklin Graham’s Decision America California Tour covered 600 miles and 10 cities from the Southern Californian coast to the Crusade Mountains. More than 57,000 people came out to worship God, pray together and hear the Gospel. 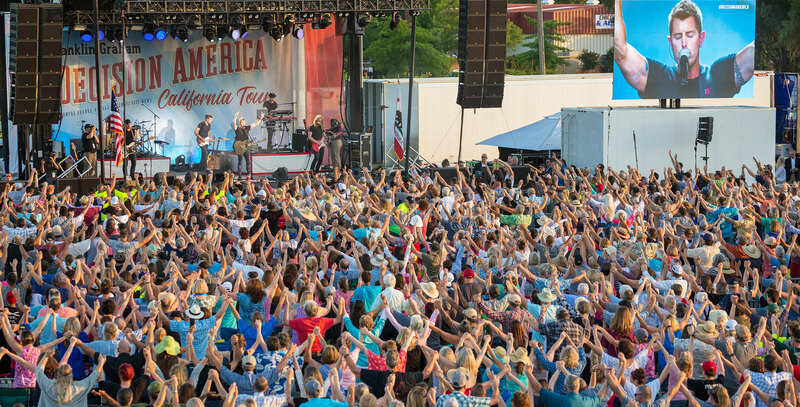 Jeremy Camp proclaimed the power of God’s love as more than 5,000 people came together in Chico, the second-to-last stop on the California Tour. 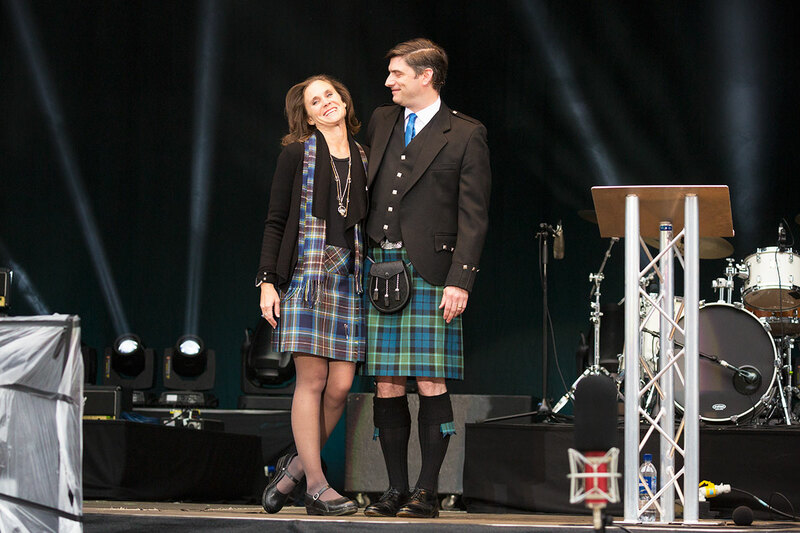 Right: Will and Kendra Graham display Scottish attire during “Kilt Night” at June’s Central Scotland Celebration of Hope in Falkirk. Will Graham’s own ancestry is three-quarters Scottish, with forefathers from the Graham, Bell and Cunningham lines hailing from the Land of the Brave. 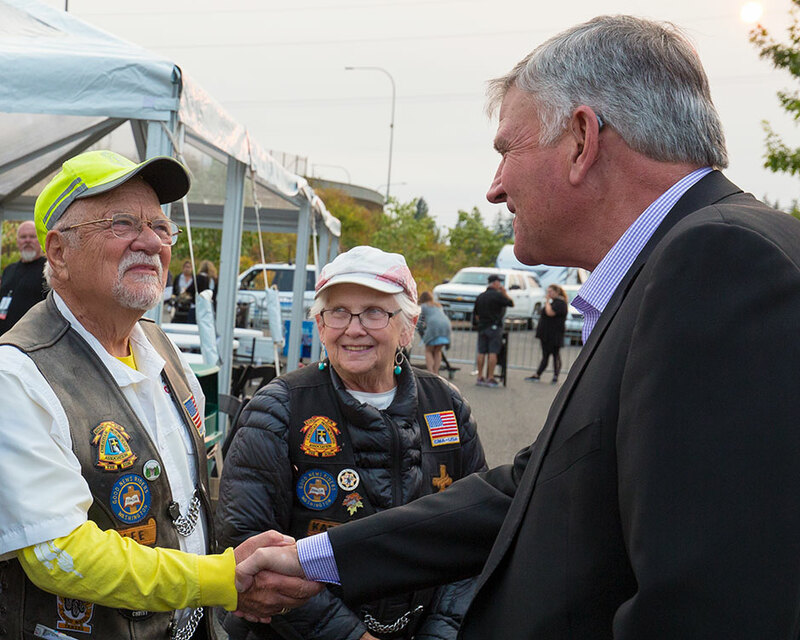 Franklin Graham needed lots of prayer as he spent two weeks travelling across Oregon and Washington, two of the most secular states in the U.S. His prayers were answered as more than 70,000 people came out to hear the Gospel and pray for their region during the Decision America Pacific Northwest Tour. 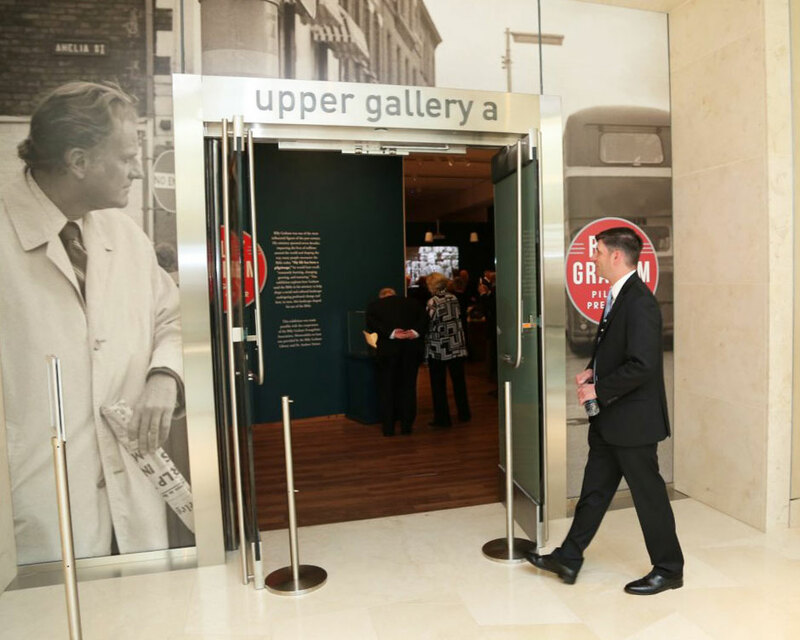 Left: The Museum of the Bible in Washington, D.C., opened an exhibit which explores Billy Graham’s life, ministry and confidence in the Scriptures through rare artifacts, photos and video footage. The exhibit is scheduled to stay open until 27th Jan 2019. Right: The purpose behind the Decision America Tour is three-fold: encourage people to recognise their daily need for Jesus Christ, guide them in praying boldly over the affairs of their state, and urge them to represent the Christian voice in their communities. The tour, which began in 2016, will continue in the Northeast in May. Two of the more than 13,000 people who came to Point Marina Park in Richland, Washington, to worship Jesus Christ amd pray for their state and nation. 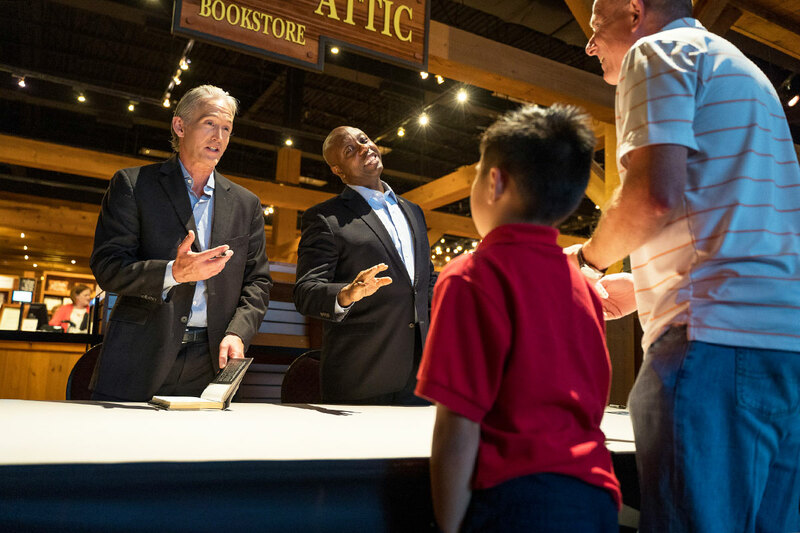 The Billy Graham Library hosted South Carolinian politicians and co-authors Rep. Trey Gowdy and Sen. Tim Scott for a book signing event in September as they spread a message of friendship, unity and hope for a divided nation. Opposition ahead of Franklin Graham’s evangelistic events in Blackpool, England, only gave the local church more resolve for sharing the hope of the Gospel. 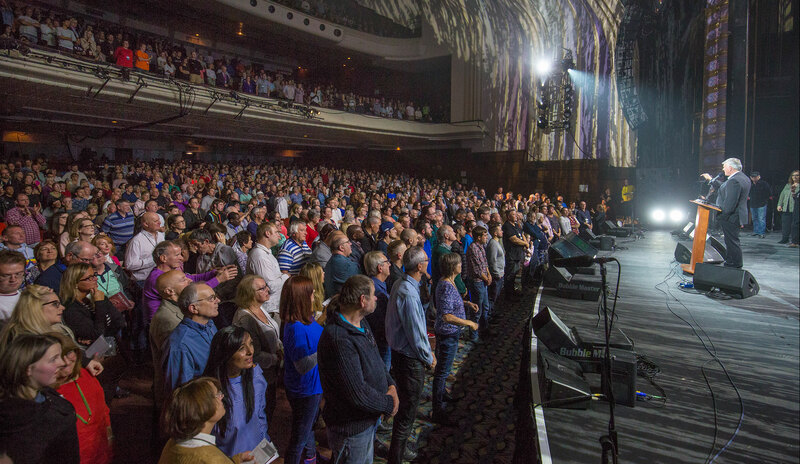 Nearly 10,000 people gathered in the Winter Gardens Opera House during the three-day Festival and were filled with the joy of Christ. Left: The members of the Irish band Rend Collective have been friends of the Billy Graham Evangelistic Association for years. In September, the band led the crowd gathered for the Lancashire Festival of Hope in worship while Franklin Graham shared the Good News in the United Kingdom. Right: Michael W. Smith, who closed out the powerful weekend in Blackpool with a 60-minute set, paid tribute to his long-time friend, Billy Graham, who passed away in February, singing his classic “Friends”. In the autumn, hurricanes Florence and Michael swept through the Southeast of America, claiming 70-plus lives and costing billions in destruction. 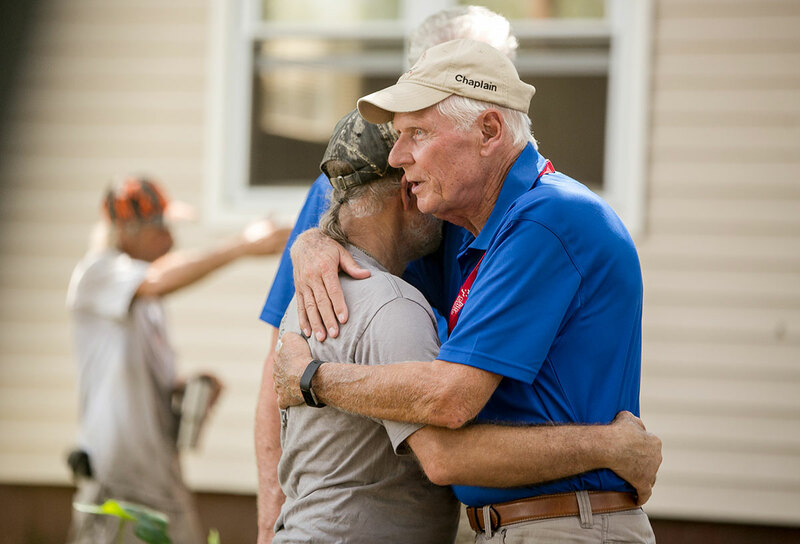 In the midst of such loss, the Billy Graham Rapid Response Team was able to offer hope to evacuees and residents in some of the hardest-hit cities, including here in New Bern, North Carolina. During the seven deployments scattered across multiple coastlines, chaplains prayed with more than 25,000 and witnessed over 250 people make a decision for Christ. 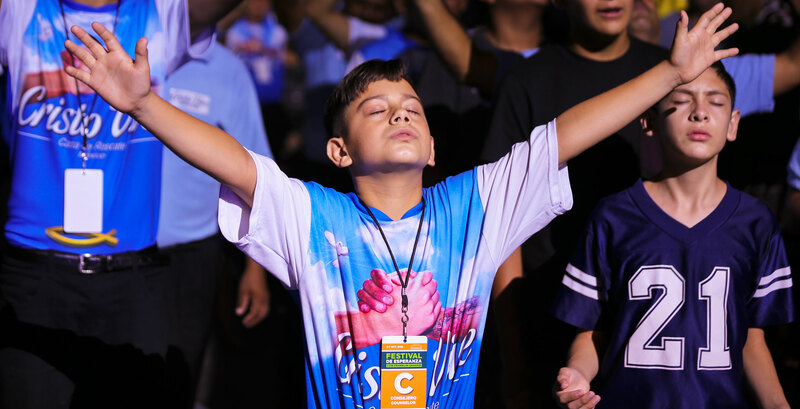 In October, thousands filled the Arena Monterrey at the Festival de Esperanza, or Festival of Hope, in Monterrey, Mexico, while another 15,000 viewers watched online. In an area that struggles with drugs and violence, attendees expressively raised their hands in worship and attentively listened to Franklin Graham share the message of salvation. More than 2,000 people flooded the floor to make decisions for Christ over the two-day event. 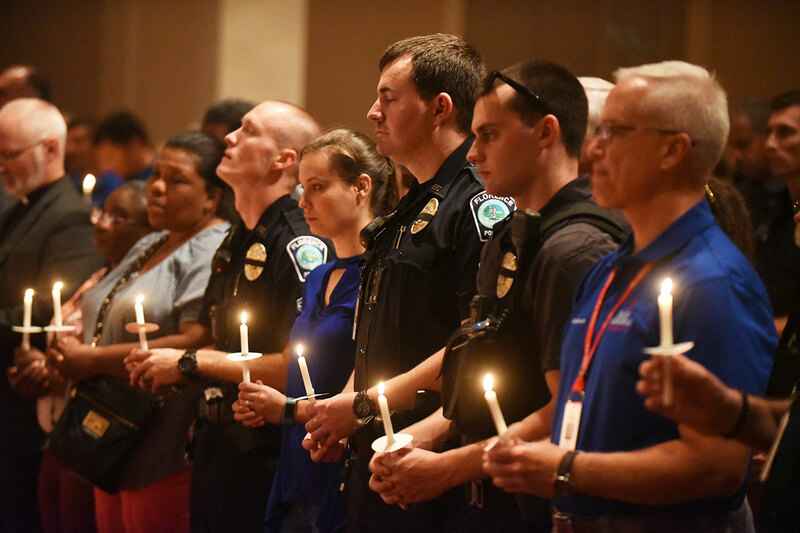 Left: Florence, South Carolina, was rocked after a deadly police shooting in October, prompting crisis-trained Billy Graham Rapid Response Team (RRT) chaplains to respond. Florence Police Sgt Terrence Carraway died on the day of the incident, and Florence County sheriff’s investigator Farrah Turner died a few weeks later. Several RRT chaplains deployed to Florence to share the hope of Christ – all of them with a law enforcement background. Chaplains prayed with nearly 500 people affected by this unexpected tragedy. 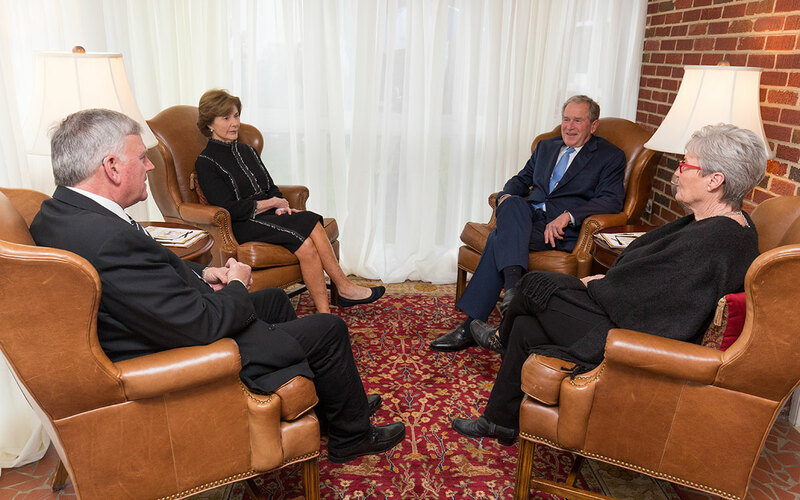 Right: Hundreds of law enforcement officials and their spouses attended the National Law Enforcement Retreat at the Billy Graham Training Centre at The Cover in Asheville, North Carolina. While more and more officers face senseless violence and man-made tragedy, there are still very few programmes that provide spiritual care and emotional help. 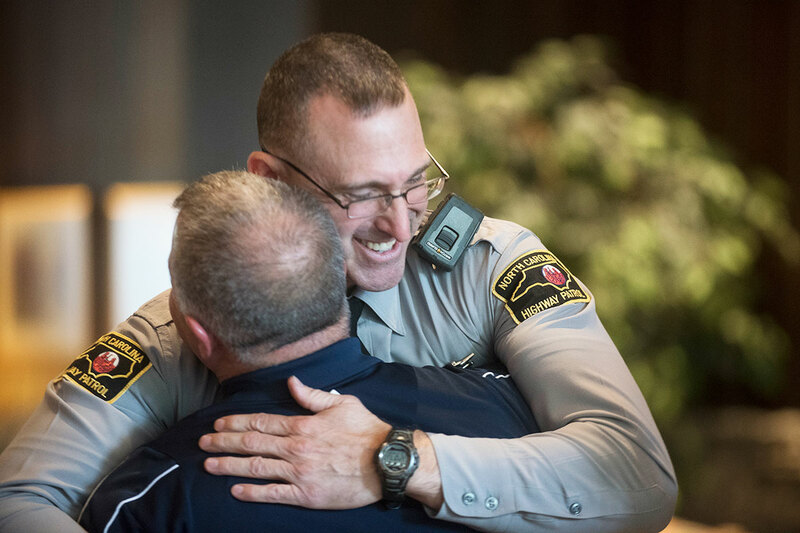 These retreats hosted by the Rapid Response Team serve to help fill the gap for law enforcement officials dealing with stress, anxiety and depression. 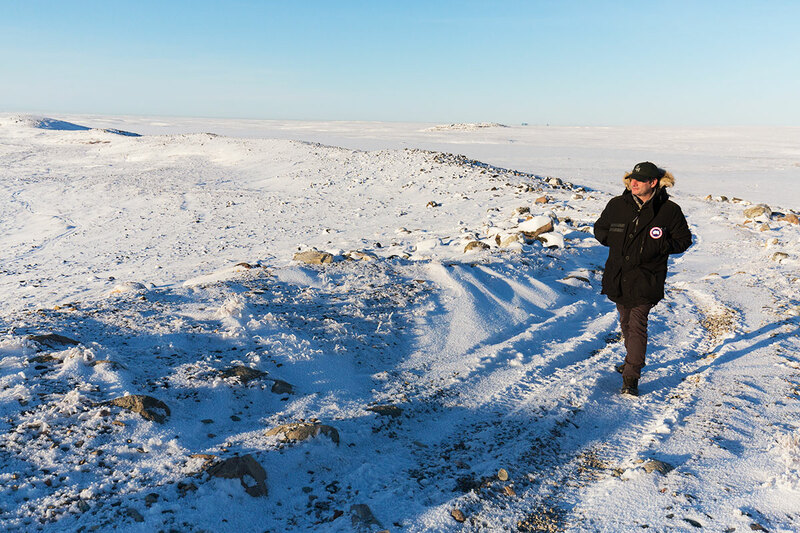 Will Graham kicked off November’s Canada tour in the Arctic town of Nunavut. 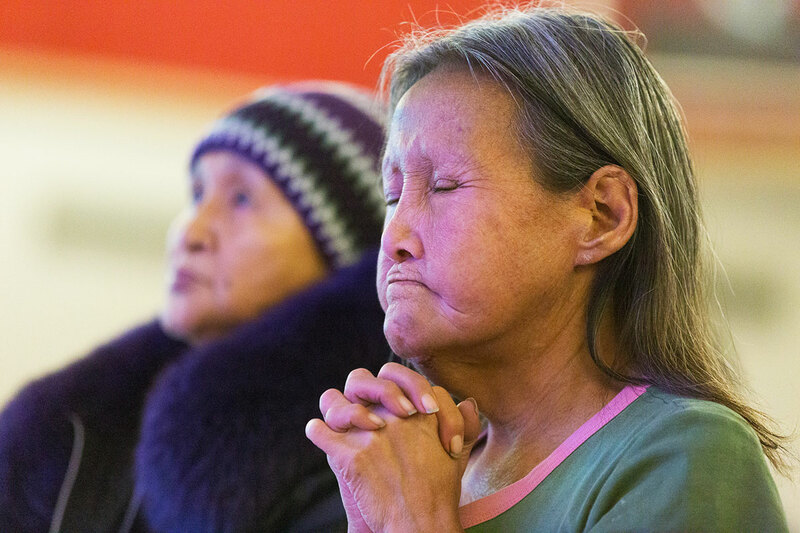 The Rankin Inlet Celebration of Hope offered the promises of Jesus Christ in one of the most remote places on earth. It was a busy year for Will Graham, as he portrayed his grandfather, Billy Graham, in the movie ‘Unbroken: Path to Redemption’, which hit cinemas in the U.S. on 14th September. He also released his first book ‘Redeemed: Devotions for the Longing Soul’ on 23rd October. 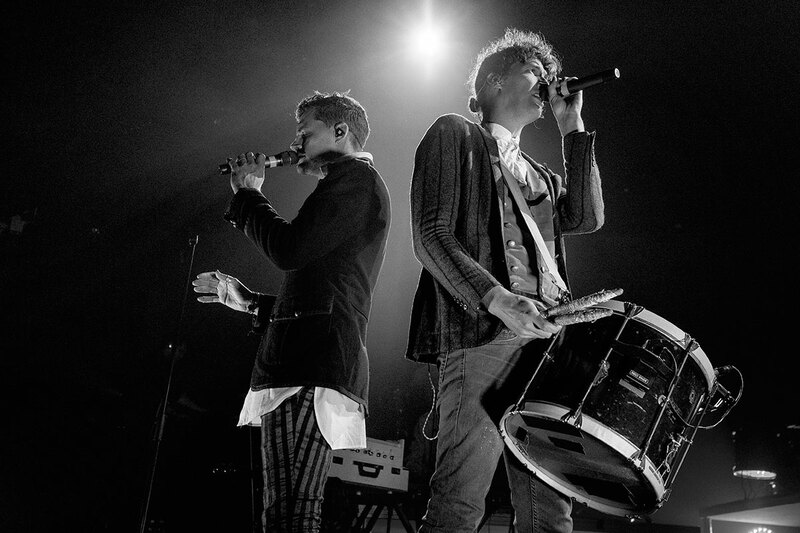 Left: Joel Smallbone (left) and his brother, Luke, of For King & Country led powerful worship on the Canada tour’s second stop in St John’s, Newfoundland and Labrador. 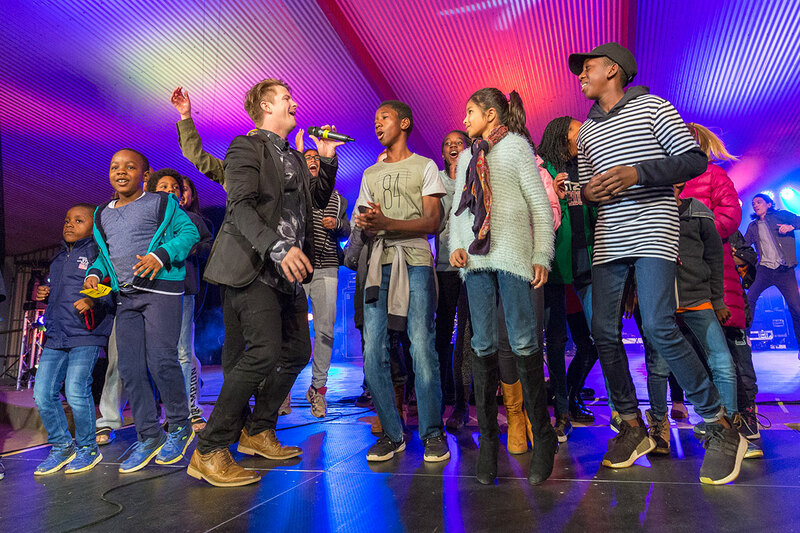 People of all ages came to Christ at the Avalon Celebration of Hope with Will Graham. Right: The Good News was welcomed by the Rankin Inlet’s Inuit people, whose community is plagued with high suicide rates, broken families, unemployment and high cost of living. 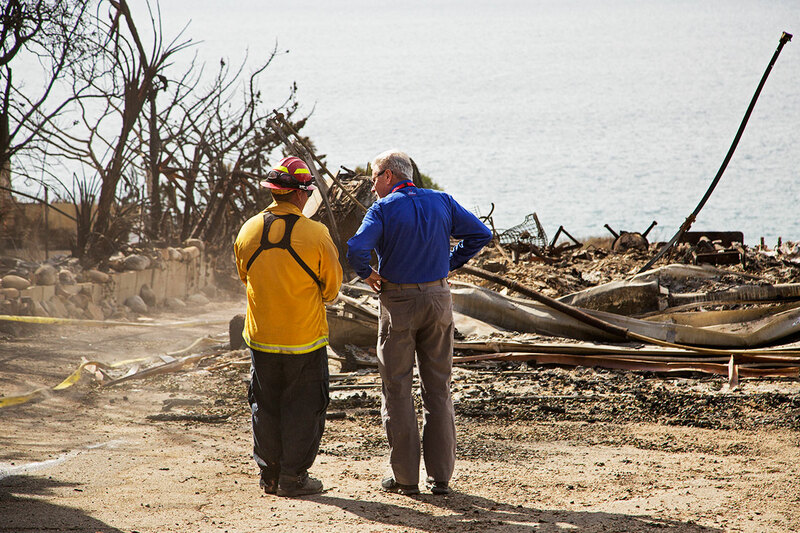 While California faced the deadliest and most destructive fire in it’s history, Billy Graham chaplains were on the ground in Butte County ministering to evacuees and survivors of the “Camp Fire”. The blaze took at least 88 lives, around 14,000 homes and over 150,000 acres. Their deployment will continue from it’s start into 2019. 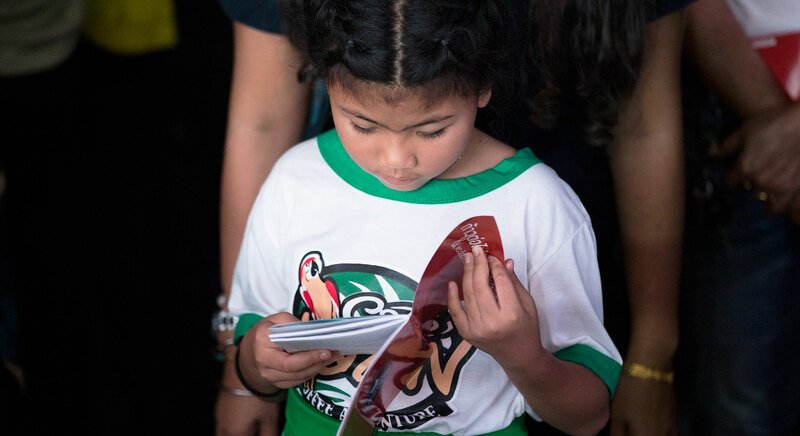 Thousands of people from the mostly Buddhist nation of Thailand heard the Gospel message – many for the first time – during Will Graham’s Celebration in December. Approximately 85% of those who came forward made first-time decisions for Christ. 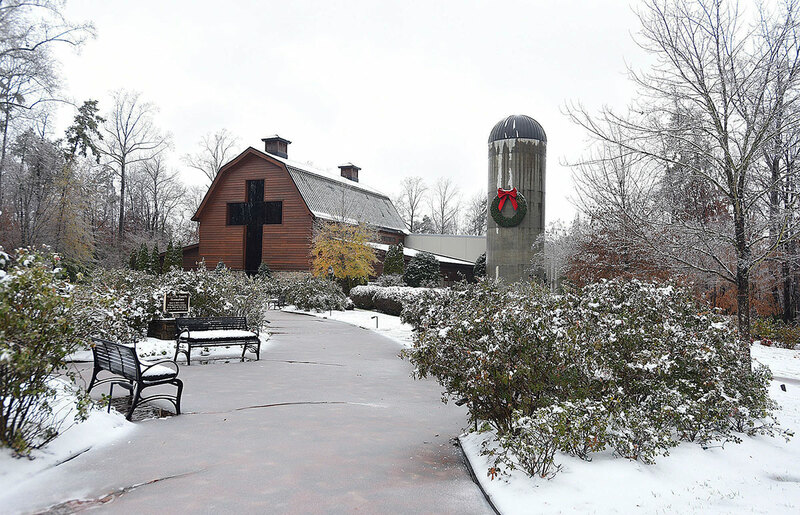 Left: Christmas at the Library at the Billy Graham Library in Charlotte, North Carolina, is part of Billy Graham’s ongoing legacy of sharing the Gospel of Jesus Christ. Right: Over the past 11 years, thousands of visitors have heard about the true meaning of Christmas. 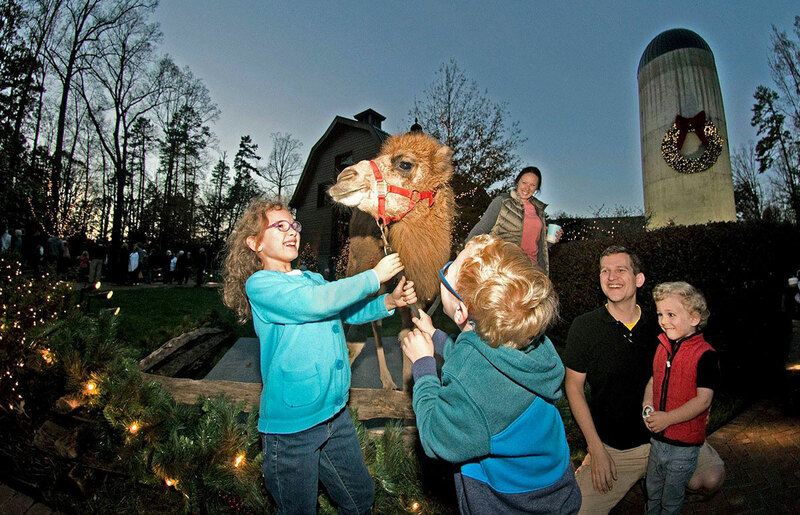 The event features a nightly live nativity as the Christmas story is told from the Bible. 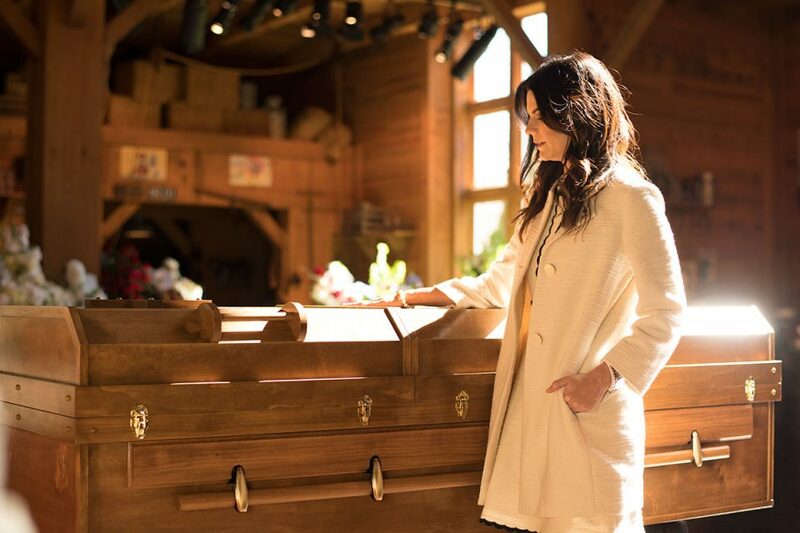 Visitors can also take The Journey of Faith tour, horse-drawn carriage rides, hear carolers, and more.